Newsflash – Major Lemming Slain in This Year’s Black Friday Sales! This Black Friday/Small Business Saturday/Cyber Monday weekend I took part in the timeless tradition of purchasing things. Luckily several lovely indie polish makers indulged me and other indie polish addicts with amazing sales and promotions! Some of them also had major restocks. 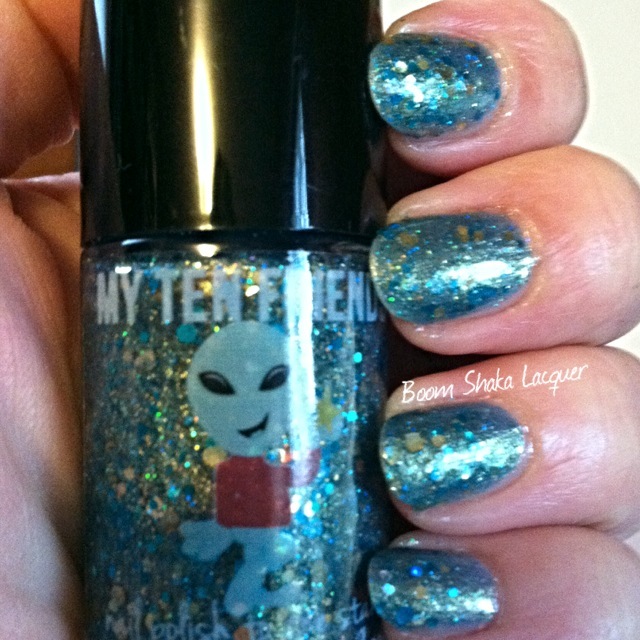 Today I’m going to talk about a polish that I woke up in the middle of the night for! Yes, seriously, the restock was set for MIDNIGHT PST which is THREE IN THE MORNING where I am, yes I set my alarm, yes I was sad that I only scored one polish…but trust me when I say I’ll be setting my alarm any time there’s a restock and I have disposable funds! So you’re wondering aren’t you? You want to know what this amazing, sleep-killing, super polish is don’t you? Well I’m going to tell you in t-minus 2 seconds! Allow me to show you My Ten Friends (*SQUEE*) Precog! O.M.G. Readers. OHEMGEE! Just LOOK at it! I can barely contain my excitement. In fact I’ve gone and looked at these pictures several times since I changed my manicure. I may or may not have taken the bottle out of the polish drawer several times to just gaze at it as well…I’ll never tell! Ok details are coming. Precog is a sky blue jelly based polish with a VERY strong gold shimmer throughout. Add to the mix a plethora of metallic and holographic teal and gold and silver glitters in a myriad of sizes! 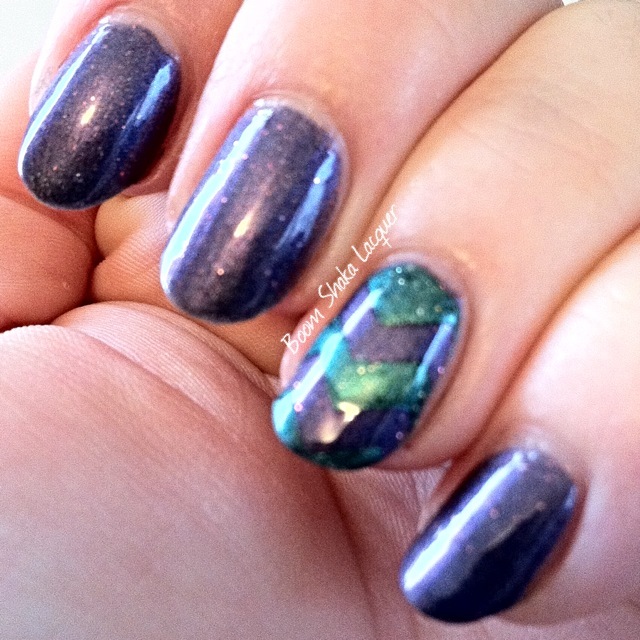 Standouts are the small metallic teal hexes and large holographic gold hexes. Sparkle city! 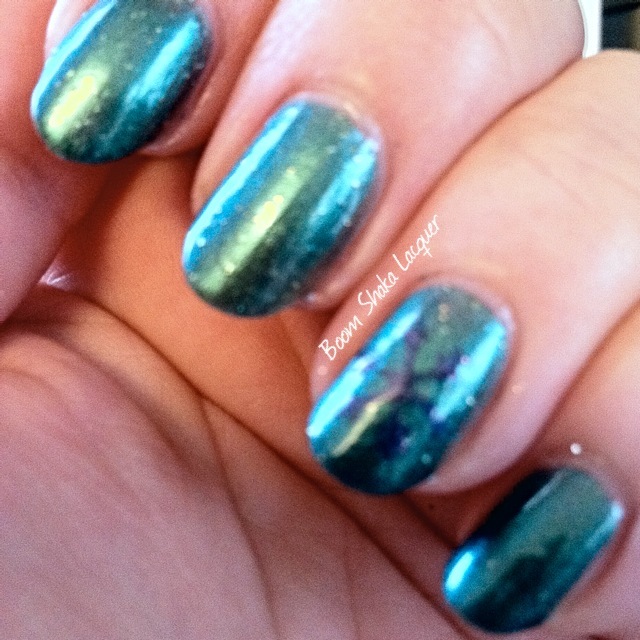 I tried to catch that gold shimmer in my pictures because in my opinion that is one of the things that makes this polish so very unique and beautiful! The formula and ease of application were out of this world…(hahahaha see what I did there?) 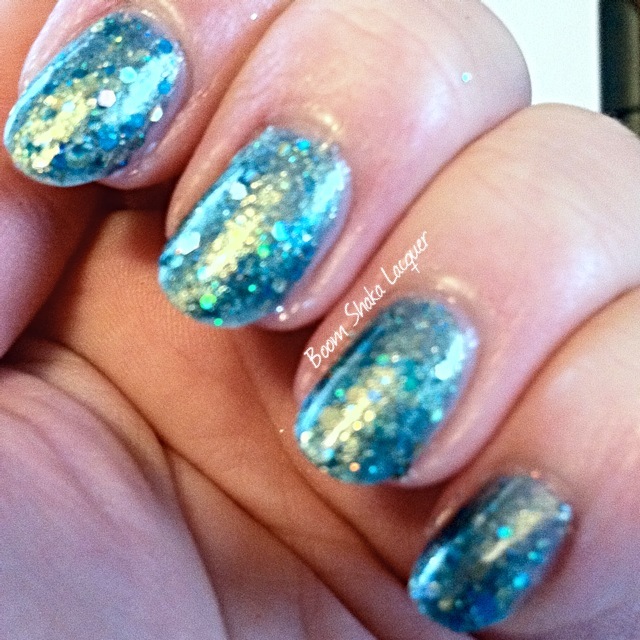 Pictures show two easy coats with no fishing for glitter, no dragging or streakiness and it reached opacity extremely easily. I probably could have gotten away with one coat! I cannot wait to get more My Ten Friends nail polishes and I urge you to follow their facebook page and check out their website to keep up to date on all the happenings and to pick yourself up a bottle of their magic polish as well! This entry was posted on December 28, 2013, in Indie Polish, My Ten Friends. 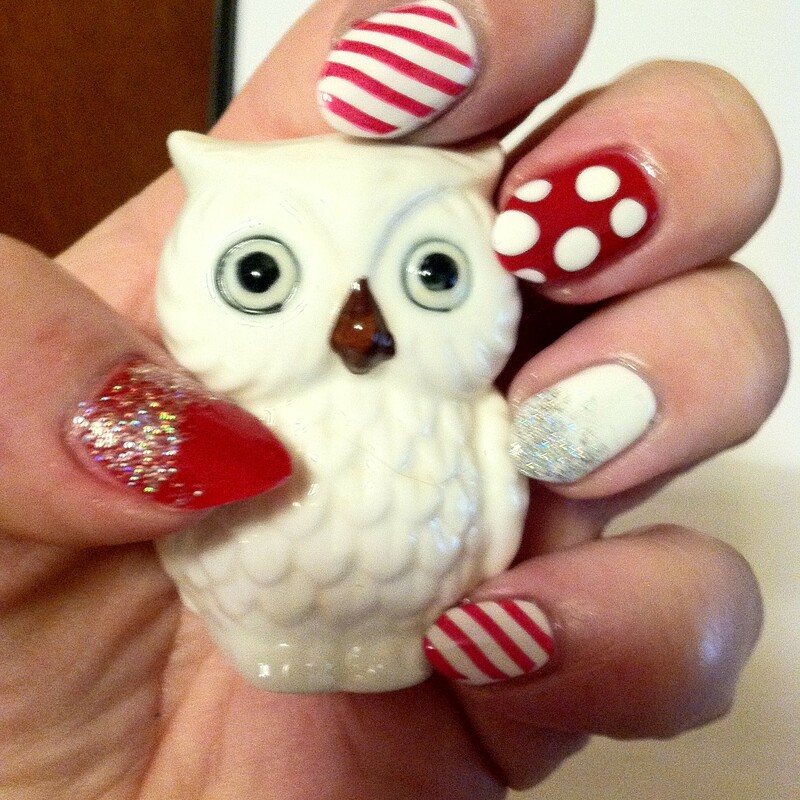 Why yes readers, I have done some Holiday inspired nail art. I have rocked a few manis over the past couple of weeks that really got me a lot of attention. I’d love to share them with you! 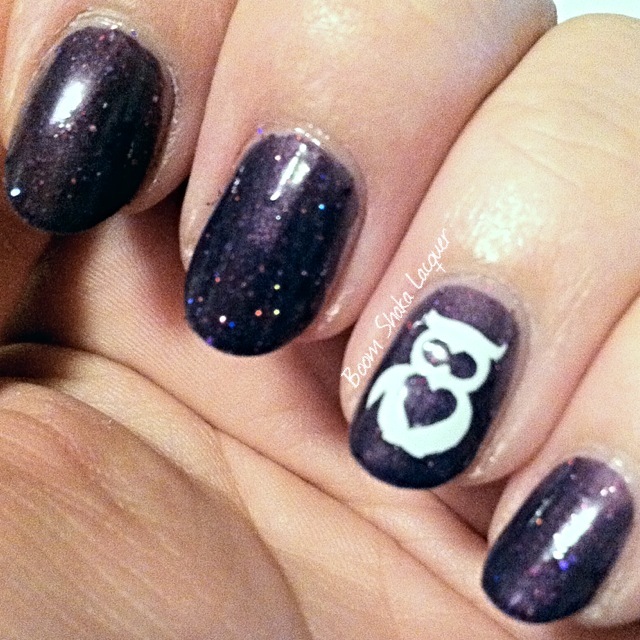 Keep in mind that I’m still new to the nail art world so if I can do these manis anyone can! They just take a little patience and the ability to laugh at your own mistakes! Isn’t it FUN? I loved this peppermint inspired manicure so much! 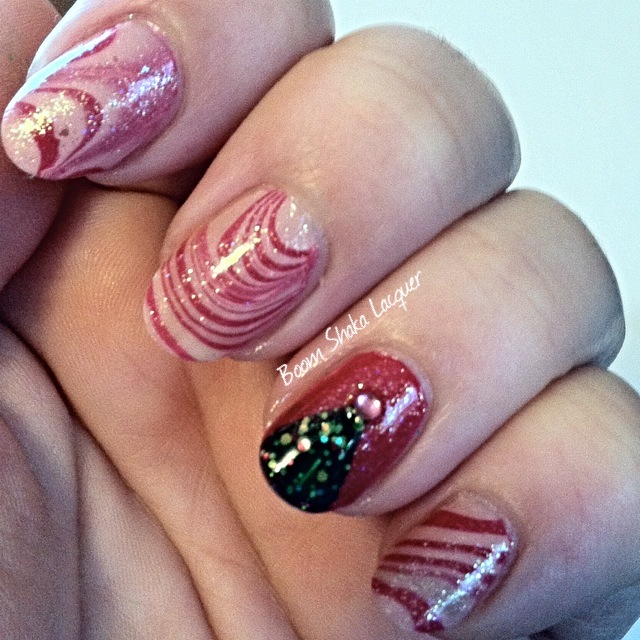 On my index and pinkie fingers I stamped a diagonal candy cane stripe. 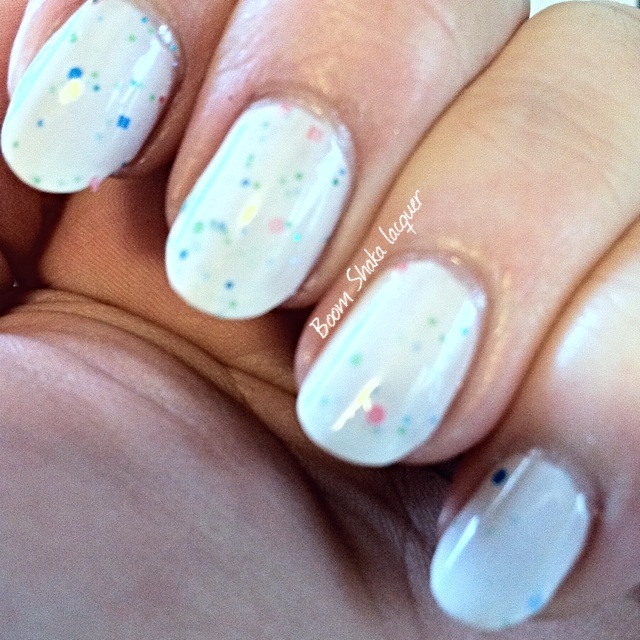 On my middle finger I used the end of a paint brush to create the large dots. Last but not least on my ring finger and thumb I did contrasting glitter gradients over red and white! This one was really an easy manicure to achieve, you could use a striper to create the stripes if you don’t have the stamps, dots are always easy and the glitter gradient is a really easy technique to master as well. I’m really proud of this next one – let me preface by saying this is the second time I’ve tried water marbling and I am utterly pleased with how this turned out. I have been following Let Them Have Polish for like three years – long before I dipped a brush into lacquer to paint my own nails. So I was inspired to do a Merry Pinkmas mani in her honor! 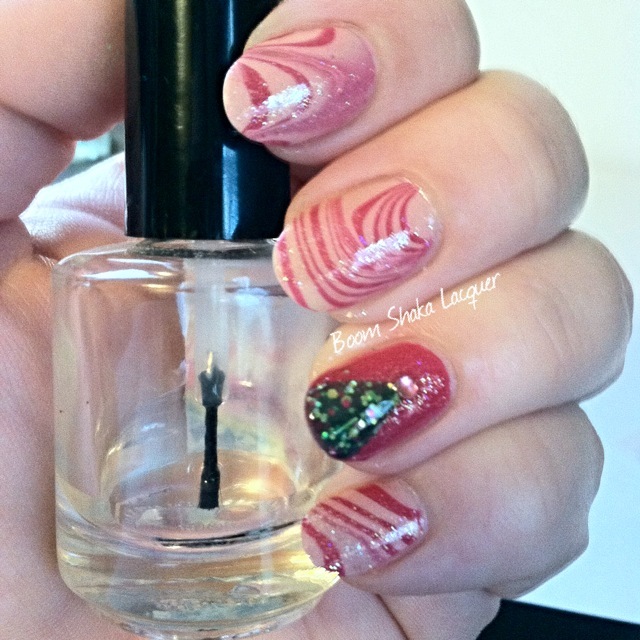 I water marbled the pointer, middle, and pinkie fingers and both thumb and ring finger had the fuschia background with the Christmas tree. Before I added the trees I topped everything off with Big Spoon Lacquers Breaking Atavism to give it a frosty glittery look. I used tape to block off where I wanted the Christmas tree and then removed the tape while the polish was still wet to give it a clean line. I then added a pink rhinestone to become the Christmas Tree star! So do ya’ll like the nail art posts? I kind of like to break the cycle of swatch after swatch! I rarely just wear a polish plain – I usually do some sort of art or pair it with complementary polishes to create some visual interest! If you want to see any NOTD pictures I often throw those onto Instagram! I joined a link party so if you want to join you can as well! 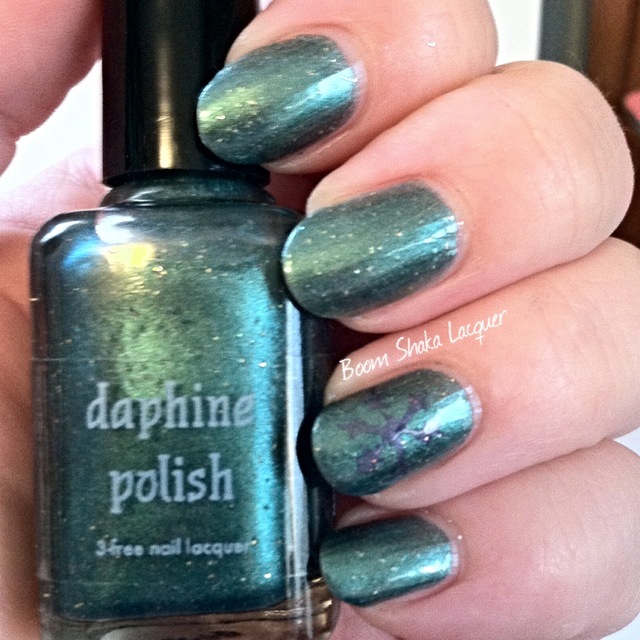 Daphine Polish – Swatches and Review! My loyal patient readers! I promise to update a little more often but as you are well aware we are deep into the Holiday Season and my level of hecticness (is that a word? Let’s make it a word.) is through the roof! There’s baking to be done, presents to buy and wrap, grocery shopping to be done, work to go to…I could go on but I won’t that’ll make a really boring blog post! Instead lets talk about my stress RELIEF and that’s nail polish! Seriously I think about nail polish and all my cares fly out the window – usually along with my money but nevermind that! Today I have two amazing polishes that were sent to me by Joanne, the creator and owner of Daphine Polish! Daphine is an up and coming indie line and I foresee many good things for her based on these two polishes! These come from her Goddesses of the Two Lands collection and are simply lovely! Seriously these colors are right up my alley and they work extremely well together as well. It was really hard for me to choose a favorite, so I didn’t. I will love them both! Let’s get up close and personal with some Egyptian goddesses shall we? First up is Isis. Isis is Osiris’ sister-wife who scoured Egypt for his dismembered body parts after he was murdered by his brother Set. She along with her sister brought him back to life. Isis is the matriarch of the Egyptian pantheon and this royal purple really does her justice! Isn’t she lovely?! I really fell in love with these two polishes. Isis is a lovely rich metallic purple that has been slightly blackened so that it’s not an in your face purple but is slightly more muted. Sprinkled throughout are metallic pink sparkles that just capture the light. The color is really lovely and classic and is the perfect base for nail art and would great under a complementary glitter topper! Formula on this one? Dare I say it…oh heck yeah I’m gonna do it…it’s heavenly. Yes I went there, I could not resist! Anyway this polish stays where you put it without any pooling or dragging or flooding but is also not thick or hard to work with at all. Photos show two coats plus top coat. It actually dries to a sort of semi-matte finish which is pretty as well but I’m a sucker for a good shiny topcoat. Up next is Hathor, now Hathor is technically Isis’ daughter in law as Hathor is a fertility goddess and the consort of Horus, the son of Isis and Osiris. Due to a long drawn out myth that I won’t recount here, sometimes you see that Isis and Hathor have the same or similar attributes in hieroglyphs but they are definitely two separate goddesses! I can see myself reaching for this one again and again. 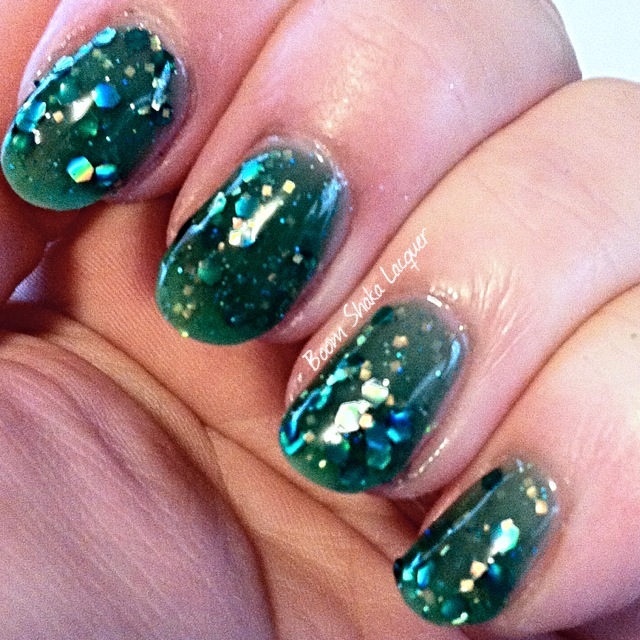 This is a very gently blackened metallic green-leaning teal polish sprinkled throughout with holographic gold sparkles. I love every single thing about this color! Do you see what I mean about the two colors going together so brilliantly? Seriously the whole Goddess of the Two Lands collection is cohesive and supports the theme beautifully. Just like Isis, Hathor went on like butter, like gorgeous metallic green/teal butter…sorry I got distracted. I had no issues with application on either of these and achieved smooth perfection in just two coats. This one also dries to a semi-matte finish that is not at all unpleasing. One of the things I don’t talk about much is brushes and bottles. Usually because I don’t find anything particular to note about them, I mean, all polishes come in bottles with brushes and they are all pretty much the same unless they are particularly horrible or great. In this case let me just say that I really enjoyed the bottle shape and the length of the cap (it’s a bit longer than standard). It really allowed me to exercise more precise control and it felt nice during the application. My impression so far of Daphine Polish has me excited and eagerly awaiting the chance to get my grubby paws on some more! 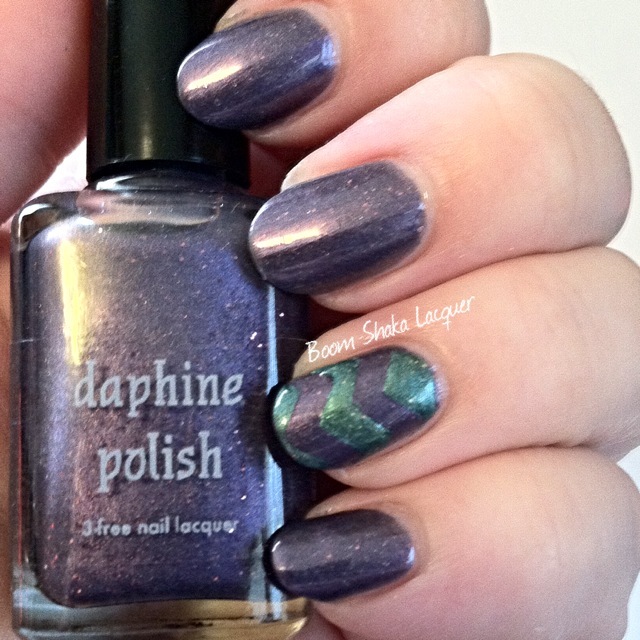 You should definitely check out Daphine Polishes if you’re looking for some new indies to dress your digits! You can find Daphine Polish on facebook and instagram to keep up with new releases and other information and you can buy these amazing polishes and so many more at her Etsy Shop! PS: I used the Royal Lacquer Vynails vinyl decals to create the nail art on these two manicures, I used the negative space of a snowflake as a stencil to get the snowflake on the Hathor manicure and I used the chevron decals as a mask on the Isis manicure. 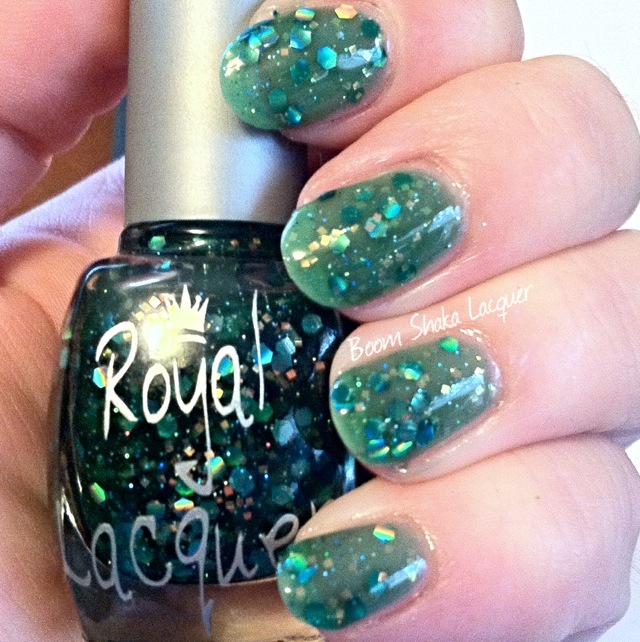 This entry was posted on December 21, 2013, in Daphine Polish, Indie Polish.